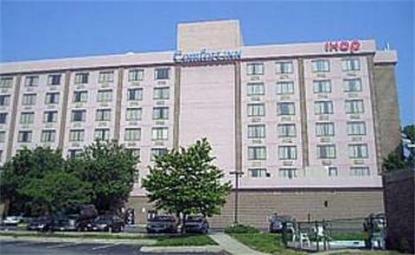 Hotel is a six-story, interior corridor, high-rise located at I-395 and Duke Sreet. The 150 spacious guest rooms have coffee makers and dataports. Complimentary scheduled service to/from Van Dorn Metro Station and ample complimentary car parking is provided. The 24-hour IHOP restaurant is located on the property and several other restaurants such as: Red Lobster, Ruby Tuesday, KFC, Boston Market and McDonalds are nearby. Washington DC 7 miles. Landmark Shopping Mall and Plaza (2 blocks), Old Town Alexandria, Mt. Vernon and other attractions within minutes. Free continental breakfast including coffee, tea, milk, juice, cold and hot cereal, roll, muffin, toast and fruit cup served at the IHOP restaurant.